Weddings are always special events that happen only once in a person’s entire lifetime. When people get married, they make the most out of their weddings to make it memorable not only to the newlyweds, but also to the people who witnessed the event. Weddings are usually attended by the couple’s family members, relatives, friends, and other people who are special to them, and these attendees would either contribute to the planning of the wedding, or give gifts to the couple during the wedding day. Because of this, it is only proper for the couple to return the favor to the people who have celebrated this occasion with them. It doesn’t have to be as lavish as what was given to the bride and groom, but a simple act of appreciation or gratitude is sufficient. One way of doing this is by sending them personalized thank you cards to thank them for all their contribution before, during, or even after the wedding day. When you have a lot of wonderful thank you card designs to choose from and why not choose more than just one? With these samples, you get multiple designs, and you also get to use a wide range of photos. Now you don’t need to worry about which one you want to use, you only need to choose which design to give to a respective recipient. This wedding thank you card design is perfect for those couples who prefer to use only one, simple-looking card design but find that a single photo on the card isn’t enough. 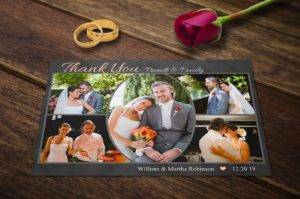 If you have a lot of beautifully-shot pictures and are more than proud to share them, then download this thank you card design. 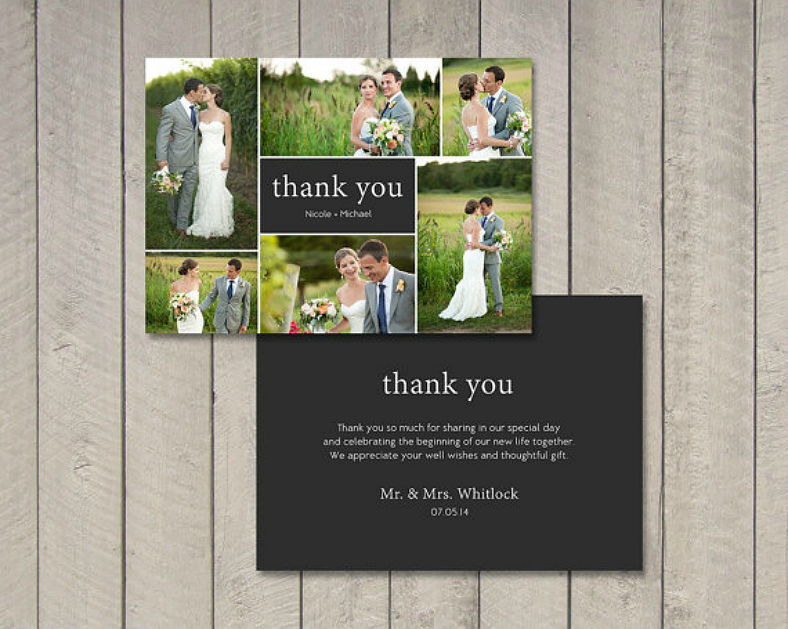 This wedding thank you card design is very classy and elegant that it already gives the reader an idea on what it is about with the presence of the thank you stamp-like image on the front, and the lace pattern around the corners of the rear page. Even at a distance, the design of this card makes it obvious enough that this is a wedding thank you card. 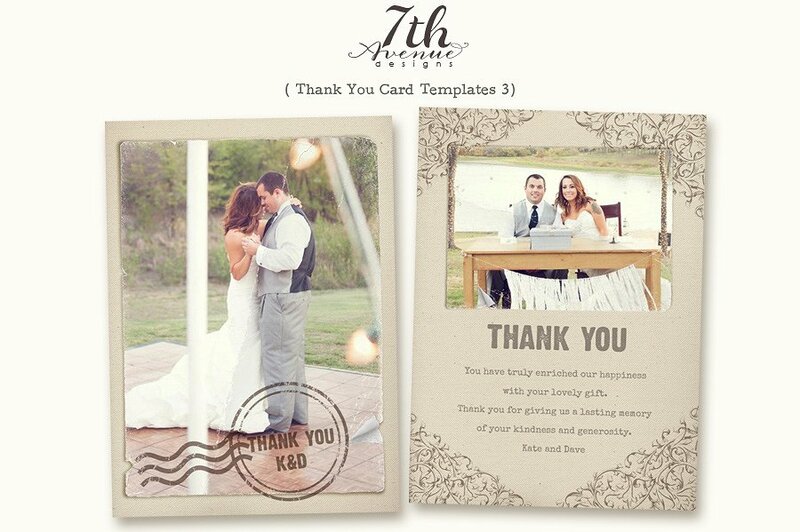 If you want to keep your wedding thank you card simple but still meaningful, then this design is what you need. You may either divide this design into two, with the text on a black background printed on the front page, and your photo on the back. Or you may also use the entirety of the design on the front page, and leave the back page blank to write down your personal message. 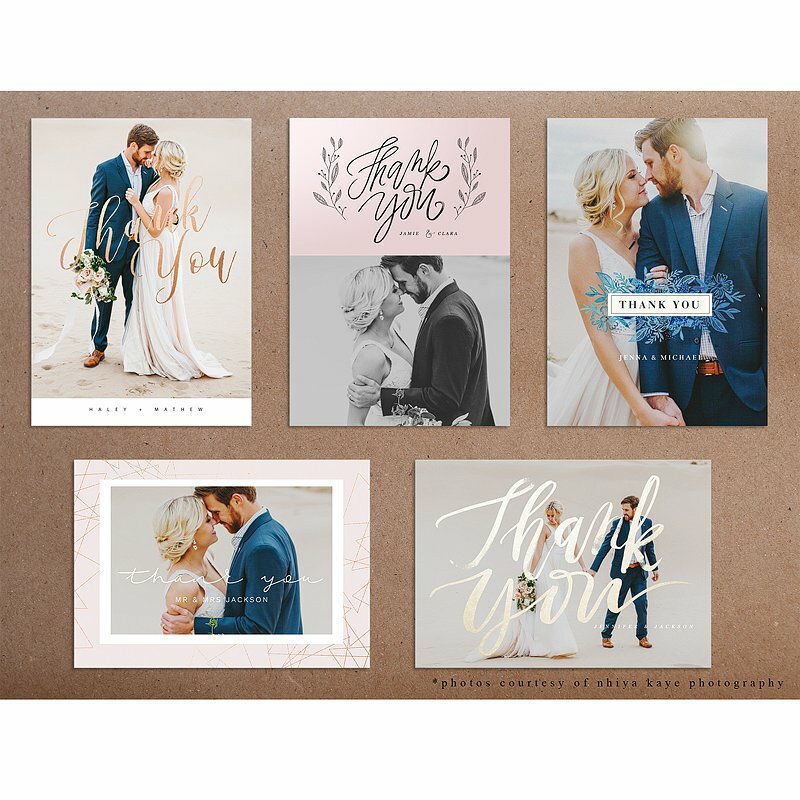 You may also choose not to include an image on your wedding thank you card and simply write a thank you on the front page, and your personalized message on the back. To keep this thank you card design from looking dull, the floral patterns on the corners are added to enhance the visual impact. Some people prefer a pre-written or a generic message on their thank you card, which is sufficient. Others would even go the extra mile and write a personalized note on the card. With this thank you card design, the back page is blank where you can choose to have your message printed or typed, or have it handwritten. If you want to make the most out of your thank you cards, you may download this design. On the front page, you can choose to include not just one or two, but at least six pictures. And on the back page, you can write you thank you and a heartfelt personalized message to the recipient, thanking them for witnessing your wedding. 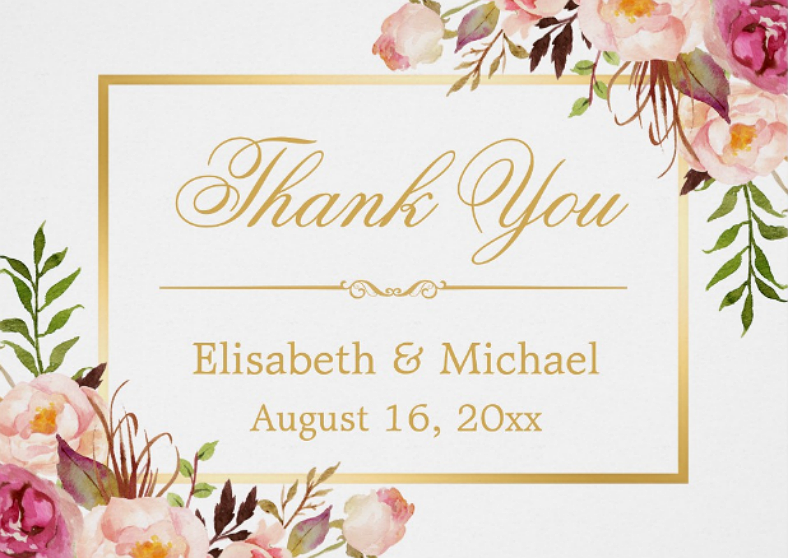 This design can also be incorporated to rustic thank you cards to further enhance its beauty. As you have seen, our wedding thank you card designs, we don’t settle for less, much like you never settled for less during your wedding. From the pre-wedding plans, we have wedding menu card designs that you can use to plan out the dishes that you will be serving. Up until after the wedding, we want you to continue making memorable moments by sharing meaningful souvenirs to everyone who have attended your wedding and those who have made your wedding successful. So what are you waiting for? Click that download button now and start making your own wedding thank you cards.